A photo-safari to the Moroccan Atlas region was completed ... and the Atlas Mountains of Morocco. The vehicle was a modified Land Rover Discovery desert camper. A photo-safari to record desert images for future travel lectures. Our 'Bay of Biscay' crossing passed in a flash - and we reached the Spanish coastal port of Almeira on the third day, took the night boat to Melilla. We had lots of African hassle to negotiate at the Moroccan border and we were well assisted by a self-appointed border guide. A cash machine exchanged our pounds for dirhams and we were through the 'Douane' in two fairly intensive hours, free to travel as far as Western Sahara. We drove south and soon reached the open desert. We turned off the tarmac at Bouarfa and made a long challenging desert crossing on a rough, ill-surfaced trail. The terrain was desolate and the trail alternated between sharp shards of rock and billowing sand. It was bumpy, dusty and HOT... and I reminded Raymond that this is what we had come for. There were a number of confusing breaks in the trail where we would stop, check our compass, maps and GPS position. Raymond's navigation was well prepared and all backed with satellite images. After six hours we reached a stone-built desert refuge at the head of a long fertile, dried river course, a 'wadi'. It occupied a high position and could be seen from afar. This was a vital landmark which confirmed our exact location. We turned down the wadi with some relief and had an easier drive south. We emerged several hours later at the 'Source Bleu', a campsite I had visited on my last trip some years ago. It was nurtured by running water and an abundant and shady palmerie. My old contact Joussef came out of the shadows to welcome me like a long lost friend - an amazing feat of memory, I hadn’t seen hime for ten years ! A happy evening followed with a grand desert dinner from the 'Kitmax Twin-top Tuckbox' and a bottle of wine smuggled from Spain. The stillness of the desert at the campsite was only disturbed by a dog's concert that night, where every canine in the countryside joined in. 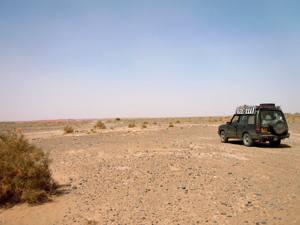 We left that morning for Erg Chebbi, near Merzouga, an isolated offshoot of the Great Western Erg across the border in Algeria. We left the road and turned off across a wide stony desert, wretchedly lifeless, with only the occasional wadi sustaining a few goats and the odd camel. We were convinced from our research that there was a fairly strong piste to be found around the east side of the Chebbi dunes, but all our waypoints and two gps navigators failed to reveal the unmarked trail we sought. After a long drive we arrived unexpectedly at the dunes, a majestic and spectacular formation in the morning sun. This isolated sand sea rises unannounced from a flat stony desert, a great golden erg stretched into the desert haze. Whispering winds sculpt the sand into a maze of crests and curves, hollows and heights all basking in the morning sun. We were at the northernmost tip. Across the sand, Raymond assured me, lay our trail. However we were travelling alone and I didn't want to enter the sands without a backup car. And while we discussed the options, unfortunately the Disco made the decision for us. Reaching for the low ratio gearing, the selection lever failed to engage, indicating a broken linkage. Sand requires power and the right gearing is essential, and now we didn't have it. A quick check revealed the link was inaccessible without extensive stripping down. We were now in a deep trough of sand and I had to apply serious shunting, clutch slipping and engine overheating to get extricated. That marked the end of that particular sand crossing and we re-routed across the gravel plain to Merzouga, and drove the easier west side of the dune instead. Our route continued up the Todra gorge by way of Rissani and Tinerhir and we found a wonderful waterside campsite on the Todra river for the night. Todra Gorge is a spectacular cleft in the rocks, cut aeons ago by the river coursing through the narrow gorge, draining show-melt from the central Atlas mountains. At this time of the year we could still drive through the narrows and admire the great cliffs bordering either side. At it's narrowest it is only a few metres wide and it is a truly powerful experience to pass through. From here we drove to Ouarzazate and then to Agdz, a small market town at the head of the Drâa valley. The scenery turned increasingly spectacular as we drove up and up into the highlands of the Anti Atlas. This formation is geologically older than the central Atlas and climate is Saharan, while the central Atlas is nurtured by the moist winds of the Mediterranean. We peaked in mid-morning at 4,000 ft and drove through a barren, lifeless terrain which developed slowly into productive land as we descended again. There was some agricultural terracing to be seen and eventually our route accompanied a small stream. This developed during our journey. 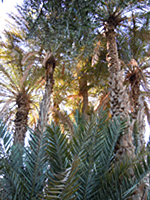 As we descended the faster flowing water supported a string of oases and palmeries. This valley is the lifeblood of Morocco and the centre of much warring in the past. Countless emires, sheiks and warlords staked their clain on the fertile areas between tdesert and mountain. It was a lawless area and there were numerous murderous skirmishes up until the tribes were subdued and united in the early 19th century. We reached the one-horse town of Zagora, gateway to the desert. Only 42 days by camel to Timbuktu, we were told… After a rest stop in a good campsite, to repack and re-plan, we ventured off down a desert piste to Foum Zguid. The track started well but petered out after 30 rattling miles at the edge of a deep wadi. I prospected on foot and chose a route across the great rock-strewn divide, and having no low gearhad to advance at the wrong speed for the terrain. The first part went quite well, the wadi was about 75 yards wide at this point, but then I hit a patch of sand which gave way under the left rear wheel as I drove over it. In front was a rock the size of an armchair. Next to it was an un-climbable sand bank and upstream was our only exit. I applied more power, the mobile suspension gripped the uneven the contours and we shot out of the wadi to a hoot of joy from Raymond, a gasp of relief from me… and a cheer from a shepherd who quickly told us we had come the wrong way. The Discovery excelled itself. I knew I had been uncomfortably close to tipping the vehicle that time and I was much relieved to regain level ground afterwards. The shepherd received a stylo biro and some melted sweets for his helpful comments. We hit the Foum Zguid junction, turned north and proceeded to Tazenakht, the carpet-weaving centre of the Atlas. Raymond bought two excellent Berber carpets while I ordered a splendid chicken tazine lunch for us both. We camped at Tafraoute which accommodated a splendid swimming pool. We were the only guests there. Dinner was brought out to us at our tent, and we dined by candle light under the full moon. In the still night air we heard the distant cries of a lone coyote on the plain below. finches, skylarks and a few soaring eagles. We crossed the mountain range, reached Agadir and started on the long journey home. We stayed at Marrakech for a night and then camped near the important Roman town of Volubilis next day. We have had a full, colourful and very enjoyable voyage and reached Spain 12 full days after setting out.